This indicator searches current set of bars (pattern) and compare it with past patterns. 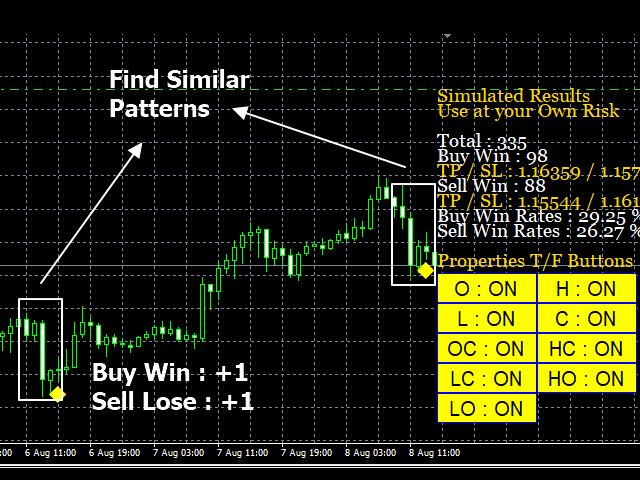 During processing the indicator makes virtual historical trading and collecting simulated results. Similar patterns will be indicates by Diamonds (rhombuses). Recommended chart bars: <= 65000. Calculation performs on each new bar. Calculation time depends of options set to TRUE. Recommended example: Open_Avg is true, and other _Avg settings are false. startcandle - Start pattern candle (last closed candle). endcandle - End pattern candle. Open_Avg - if true, compare open price. High_Avg - if true, compare high price. Low_Avg - if true, compare low price. Close_Avg - if true, compare close price. O_C_Avg - if true, compare open-close price. H_C_Avg - if true, compare high-close price. L_C_Avg - if true, compare low-close price. H_O_Avg - if true, compare high-open price. L_O_Avg - if true, compare low-open price. CutLine - Precision percents (From 0 to Max=0.99 - Higher value means more precision). Added Under True / False Properties to Graphical Buttons.